Garment assembly is fundamental to the creation of designs. This guide provides fashion students and designers with the knowledge of the techniques and components essential to the assembly of sewn products. 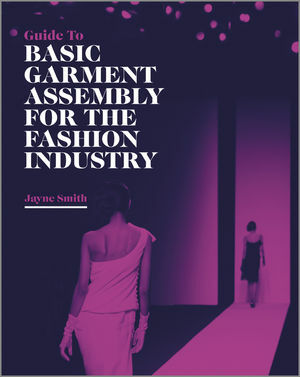 Guide to Basic Garment Assembly for the Fashion Industry develops your understanding of which stitch and seam types to select for particular fabrics and garments. As well as the knowledge to construct a range of basic techniques to assemble entire garments using the correct components. Jayne Smith has worked in the fashion industry for over 30 years. Her passion for fashion assembly led her to deliver this discipline at the Scottish College of Textiles and the School of Textiles and Design at Heriot Watt University. Jayne held the position of Director of Learning & Teaching at Herriot Watt University for many years and was responsible for developing and implementing the overall strategy. Jayne is also a talented Product Developer, specialising in assembly and creative pattern cutting for fashion. Her expertise has led her to deliver the discipline in many universities and colleges across the globe.